Designed by Quixote Consulting founder Rob Fletcher, Name That Tune! 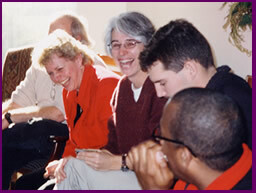 Music Team Building Fun for Everyone is specifically designed for music-related team play and team networking. Name That Tune! Music Team Building Fun for Everyone lets everyone play by leveraging people’s passion for music without anyone playing an instrument (unless they want to). Name That Tune! Music Team Building Fun for Everyone connects people’s universal passion for music with your conference or dinner in a fun, risk-free environment. No musical ability needed! And everyone can play, all at the same time, no matter how large your group (500 people? No problem!) or small (actually, if you have fewer than two people, we may have a problem). And, there are lots of opportunities to win. The core of Name That Tune! Music Team Building Fun for Everyone is the classic Name That Tune game. Teams guess the names of songs and the artists who sang them. The songs are fairly evenly spread out over five decades: 60s, 70s, 80s, 90s, and the 2000s. This allows for maximum contribution by everyone on the team (especially important if you have diverse ages participating). Some songs are easy, some are hard – all were famous in their era and beyond. Each team gets to guess the name of each song at the same time, which means everyone is involved and having fun from start to finish and there are lots of chances to win. Music-themed icebreakers energize your people and get them up and moving around, while learning fun interesting trivia about other members of the team. Name That Tune Speed Round – The songs come fast and furious! Crossroads-Style Air Guitar-off – All ready for you to set it to ‘11’ and rock out! More Cowbell! – How are your cowbell chops? Triangle Solo – If the Foo Fighters can have one, why can’t you? Kazoo-Off – Check out Stairway to Heaven on the kazoo! Rename That Song – If they wrote that song about your team, what would it be called? ‘We Are the Champions’ Name That Tune Head to Head Grand Finale! Name That Tune! Music Team Building Fun for Everyone is great for networking, at dinner, in the evening, or in situations where teams can’t move around much but you want to do something fun and interactive that energizes and builds team work. High Tech or Low Tech – You decide. Name That Tune! Music Team Building Fun for Everyone can be part of a multi-media experience onstage at a conference or through a sound system outside at a company picnic. We work with the space and technology you have available. Whatever your situation, we come with fun musical and costume props. Name That Tune! Music Team Building Fun for Everyone can be just for fun or can include a debrief around leveraging passion and play by a trained facilitator. The debrief can be customized for your group goals.